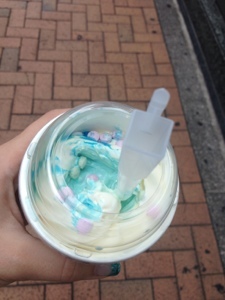 New Mcflurry in Japan. Tropical flavor. Basically some blue dye and rockets mixed in. So yummy ice cream then you chew the candy and becomes like dust in your mouth. Would have been better if they chose chewy candy instead. Next time I'll pass.